CD Label King Records Co., Ltd. This is the same recording as the other "Ostinato" disc on this page. The only difference is that this one was released about 7 years earlier with different artwork and tray inserts. Otherwise the CD's are exactly the same music wise. I REALLY enjoyed this CD. While there is nothing new on here that I don't already have, it's a really nice "Best Of" type disc. Also, unlike the Futureland recordings from this period of films, these tracks are in stereo rather than mono. Either of the two "Ostinato" discs are worth picking up if you can find them. Since they are both the same music wise you don't need both unless you are a fanatic like me. If you can't find these, a more inexpensive and easier to find buy is probably the US two CD's by GNP Crescendo, # GNPD 8055 and GNPD 8056. Despite many requests over the years, Akira Ifukube initially avoided performing his Godzilla music in concert, because he feared it would not work well outside of the context of the films. That changed in 1983, when he finally gave in to popular demand and composed the three-movement "Symphonic Fantasia" (aka "Godzilla Fantasy") and began touring with it. 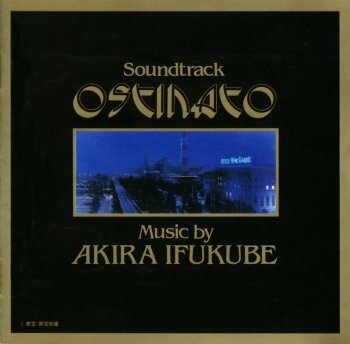 Unlike "Fantasia", which is an orchestral suite derived from Ifukube's monster scores, "Ostinato" consists of faithful studio rerecordings of specific film cues. It was recorded in 1986 to accompany a video of Toho outtakes, and the music itself was released the same year on LP and CD (K32X-7037), including extra tracks not used in the video. Later, some of the music even turned up on the soundtracks of "Godzilla vs. Biollante" and "Godzilla vs. King Ghidorah". In Dec. 1993, during the 40th Anniversary merchandising blitz surrounding the release of "Godzilla vs. Mechagodzilla", Ostinato was reissued with a different cover (KICA-2212) . *1	Or possibly "Hiromu", "Hirome", etc. *2	Or possibly "The Invaders' Premonition".